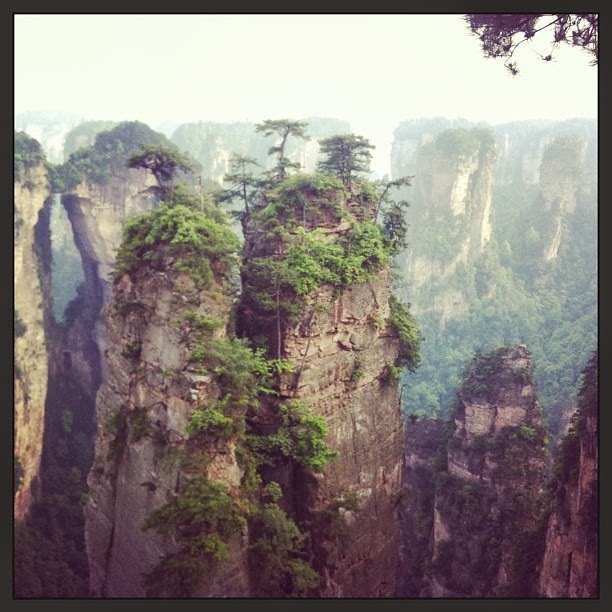 We came across a picture of Zhangjiajie Forest National Park two years ago on a "40 places to go before you die" travel article. It seemed eery and strangely familiar, then after reading into the National Park, realised the rock formations, seemingly floating in the mist, strongly influenced the world of Pandora in the 2009 Science Fiction film Avatar written and directed by James Cameron. Zhangjiajie was not so easy to reach from Singapore. After an exhausting journey of connecting flights, and a couple of bus of journeys over a few hours, we finally made it! We were lucky to have a mix of weather conditions: the incredible atmospheric mist, and blue skies and sunshine. The National Park itself is huge, once you get into the park there are numerous buses taking you to various stops in the park. If you are like us and only speak English, be prepared and ask your hotel concierge to write down in Chinese characters where in particular in the National Park you want to go. We walked along the mountain tops and also on the grounds of the rainforest - we would strongly recommend both. However we suggest that if it is a sunny day, walk on the forest floor, but if it is misty, definitely get up there via the gondola. The National Park has been adapted to fit with the thousands of tourists that visit daily. There are numerous gift shops, and various types of F & B stalls available, from local dishes fish on a stick, to ice creams and even a McDonalds!